A dental crown is a protective tooth shaped helmet that sits completely over your tooth, or a dental implant, all the way down to the gum line. It helps to restore the tooth to its natural size, shape and colour, protecting the weakened structure underneath and allowing you to eat, chew and smile normally. When you have a considerable part of the tooth that is filled, then the chances of this failing or breaking is much higher. It is for this reason there comes a point that a crown is needed to preserve and protect any remaining tooth structure and ensure a good long- term future for the tooth. You may have heard of a crown called a tooth cap or tooth crown- they are just different phrases for essentially the same thing, although they can be made from different materials as you will see. Why would you need a dental crown? Problems it can solve. 1. Large fillings- By far the most common is to protect a compromised tooth- one that has a considerable sized filling that has broken, is failing or perhaps it’s just an extensive cavity. 2. Root canals-If you have had a root canal on a back molar tooth, we know that after removing the blood supply as before the tooth is 5 times as brittle and likely to fracture. It is for this reason and the heavy forces that ‘root-canalled’ teeth are required to sustain, that the ADA (Australian Dental Association) recommend crowning all posterior (back) teeth that have been root filled. 3. Cracked teeth – Crowns are often the treatment of choice for cracked teeth, especially molar teeth where the cracks are not easily diagnosed. A crack extending into the tooth can begin to affect the nerve, if the tooth continues to be flexed, a protective helmet can solve the pain problem that may accompany it, thus preventing propagation of the crack and further damage to the tooth. 4. Tooth wear- Crowns can also be very useful in worn tooth cases, where it is necessary to increase the height of the teeth, parts of which have been lost over time. This procedure is usually part of a full mouth rehabilitation. 5. Aesthetics- Cosmetic crowns may be required to restore shape, size and colour to fractured, broken, traumatized, heavily discolored or decayed front teeth or as part of a cosmetic make over. 6. Implants- Crowns are also needed to restore a tooth on top of an implant. These are referred to as implant crowns; they can either be screwed into the implant (preferable as easier to fix if there is an issue), or cemented in. 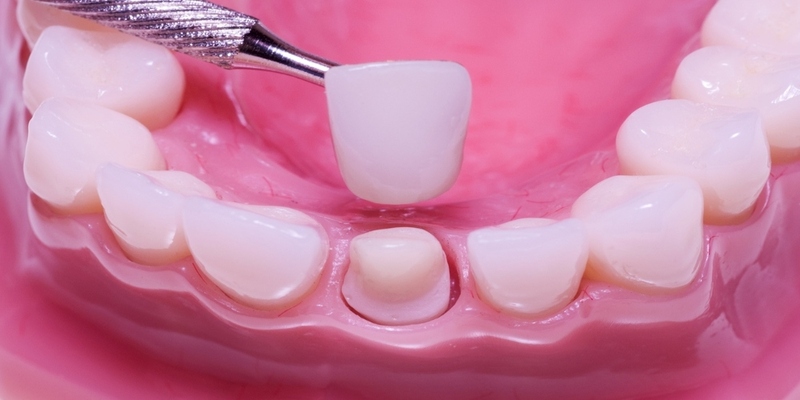 Crowns also form a component of dental bridges by providing the support either side for the fake tooth in the middle. You will not experience any signs or symptoms which indicate that you need a crown. The bigger a hole or piece of tooth that’s missing, the more likely a crown may be needed (1/3 or more of the tooth) to ½ the tooth). Crowns are very predictable where there’s some decent quality tooth structure remaining to help hold it in place. White crowns – these can be all porcelain crowns made of zirconia (very strong, good in thin sections but they have limited shades so are preferred for the back of the mouth). Emax crowns – (highly aesthetic and excellent for the front of the mouth where aesthetics are paramount- but they aren’t as strong, so are not suitable for your grinding teeth). PFM – (porcelain fused to metal crowns – the staple of the crown world for many years and still the most widely made crown today- very predictable, good strength and pretty good aesthetics). Metal crowns – principally full gold crowns; a fantastic material that can be made very thin and yet still maintain excellent strength. However, due to its colour, these tend to be reserved for back teeth. “A crown will take for most part, two appointments: I will explain in a moment. You may have seen ‘one day’ crowns advertised i.e. no need to go away with a temporary – just sit tight for an hour or so whilst it is made and then it can be stuck straight in. My honest opinion is they are not as successful as the traditional method unless they are in the hands of someone highly skilled in their use. The fit, aesthetics and margins in my experience – (please bear in mind I haven’t used them myself; just seen the results in patients who’ve come to see me) just aren’t as good. Assuming you’ve had a consult with me, and a crown is needed, the nerve has been tested and is still alive or the tooth has been root filled – you’re ready for the crown. Your first appointment will be the preparation – this will involve making you numb with anaesthetic, removing any old material and placing a new core for the crown to sit on (this is not always needed… the current filling may be adequate to use). I’ll then file the tooth down in specific proportions allowing the crown to be made to the right shape and thickness for aesthetics and strength. An impression is then to send to the lab (on which the crown will be made), a correct shade matched to your existing teeth, and finally a temporary placed to hold the space – making sure the core is protected. By your second appointment, all the hard work has been done: I’ll need to make you numb again, pop off the temporary, clean up the prep and then depending on the type of crown, choose an appropriate cement to stick it in with. A crown is the best long-term solution available for repairing an extensively damaged tooth. There are risks, as with any treatment, that something could happen to the restoration. These risks include the crown coming off- unlikely but it does happen…possibly due to the cement failing, or the core breaking off inside- hence why some nice solid tooth is needed to place the crown on. Crowns can chip and occasionally fracture if you put them under considerable stress, or if the wrong crown has been selected for that particular position. People who grind and clench their teeth are more likely to have this happen and should wear a protective night splint. It may also happen if the dentist hasn’t given enough space for the crown and there’s insufficient thickness of material for the required strength. Another further issue is that the nerve inside the tooth has a problem- remember dentists aren’t always sure about the state of the nerve, when restoring very broken teeth. Before placing the crown, the nerve will be assessed and a root canal treatment carried out if required. Sometimes the tooth dies off later – after the crown has been placed – and then we need to go back in through the top of the crown, carry out the root canal, and fill up the access we created with white filling. It’s generally not necessary to replace the actual crown. Success rate/ how long do they last? On average we expect a dental crown to last 10-20 years, but it may last even longer. The tooth – (quality of the core, amount of tooth structure left and the vitality of the nerve inside). The dentist – (experience, preparation, impression and cementation). The technician – (quality and fit of the crown). The crown – (right choice of material for position and strength). The patient – (how well you keep it clean and look after it). These treatments depend on how much of the tooth has been lost. Indirect restorations- i.e. those that are made in the lab are inlays and onlays. These follow a similar treatment procedure, but only replace the missing part of the tooth. These more conservative treatments are good in certain circumstances. If the purpose is simply aesthetic, then there are minimal treatments that may be more appropriate. For example, if you have a tooth that is discoloured or crooked, there are better options available. Please consider preserving your healthy natural teeth as much as you can… start with whitening, braces, or Invisalign. Remember once you have had a crown you will always need a crown! Even if part of your front tooth is missing, amazing results can now be achieved with composite white filling, composite veneers or porcelain veneers before a crown is necessary. Dr Jamie will give you his thoughts and help guide you through the different options. After the first appointment you will be leaving with a temporary crown. You’ll need to respect the temporary crown and go a little easy on that side especially when chewing. It can sometimes be a little sensitive and a sensitive toothpaste will help. If you experience any more severe pain, you’ll need to contact us. Remember, you’ll need to brush well and keep the temporary clean – if you need to floss, floss down and pull through because if you try to take the floss back up, you might catch and damage the temporary. You will also be numb, so just be careful in this regard- don’t bite your lip, nothing too hot, don’t eat or drink in public until the effect has worn off. The temporary may feel a little rough at first, but will smooth out over a few days. Once the final crown has been placed you can treat it as normal – brushing and flossing it like you would a normal tooth.